Very old school choice and not my preferred #1 option but starting on the right idea. However, there are actually quite a few options when it comes to the top rated survival saws. As long as the focus stays on the best ones currently available, there’s no lack of quality. Whether going with a folding saw, a bow saw (built for survival/bushcraft), or a pocket chainsaw, there are plenty of great options out there. There can be some pretty huge differences between saws designed for constant use around the house (or a work site) and those that are made with emergency situations out in the wilderness in mind. Understanding this can help differentiate two saws that look alike but are otherwise very different. There are plenty of options here, and I own one of all three types. In other words, there’s a lot here to like. What Should You Look for in a Good Survival Saw? 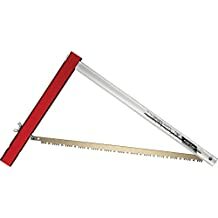 These are what most people think of when they hear the term “survival saw.” These saws are also sometimes referred to as pocket saw or pocket folding saws. Usually about twice the size of a pocket knife, these aren’t designed for long term use but as a tool that can quickly be accessed, used, and then put away. This is a great quick tool that offers a really good balance between what a larger non-survival saw will offer and your smaller more traditional survival saws. Great for bugout bags or a basic tool set – and have non-survival uses around the property for low level cutting or pruning work. These folding saws are relatively inexpensive and work as a great survival saw or bushcraft tool however this isn’t meant as a long term bushcraft piece. Think of this as an outstanding supplement of a cutting table. Great example of a pocket chainsaw after a job very well done. These are a definite upgrade over wire saws and are by far and away the lightest and easiest to pack away, making them idea for many survival situations. These are not the type of saws that you are going to use around the house. These chainsaws are the natural evolution of the wire saw. They also do a much better job, getting far better results with less energy spent. These are very lightweight, fold up very nicely, and almost always come with a carrying pouch that can easily be attached to a belt or even a blue jeans belt loop. This allows for easy carrying hands free, which is always a bonus. These are easy to pack in bug out bags, backpacks, or even just in a jean pocket when going out to the woods. The best of these saws do take up energy to use, but they can be an incredibly effective way to break down wood. This is especially true with breaking down decent sized branches or small trees. That means solid firewood on top of basic kindling. If you don’t like carrying a lot of weight, this is a great choice for a survival saw. Not a survival version of a bow saw, but a good classic model they are based off of. Okay, some people consider these survival saws and while I’ll openly admit out of these three options this is my preferred one by far, and the type of saw I grew up using to cut firewood in Scouts, I’m not sure that bow saws should be considered as an actual piece of survival gear as opposed to standard outdoor tools. If you always have one in your vehicle for those just in case scenarios, then great. There are specific bow saw designs that might be considered more survival oriented. These are more compact, sometimes even folding in nature. 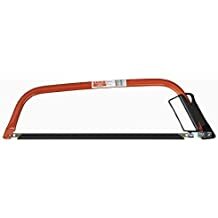 Those types of bow saws get an extra mark from us because if a piece of equipment is too large or impractical for most wilderness survival scenarios then what good is it? These are some of the most common manual saws that most people will be familiar with. Jon and I certainly remember these from the Boy Scout days! There’s no denying that for many people folding saws really are the very definition of a survival saw. While there are others who will argue, these are a rock solid choice. Folding saws are easy to pack, easy to use, and easy to carry. That’s a great combination for any potential survival situation. 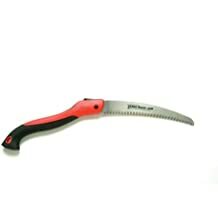 A take off of the more conventional pruning saws, these are excellent tools that can be very handy in a survival situation. Folding saws have several natural advantages. They are easy to pack as well as easy to carry. Maintenance on these saws are easy. While it doesn’t have quite the cutting power of a pocket chainsaw or the ease of use of a bow saw, there’s a nice middle of the road versatility between the two and that’s where these saws really shine. Read on to learn more about our top rated folding saws. Bahco is a name that comes up consistently when comparing saws. If you’ve ever worked with one, it’s not hard to believe this. The Laplander stands out as one of the best folding saws out there. Versatile, well-designed, and effective, this folding saw is an outstanding saw option. The blade measures 7.5 inches in length which is a solid number though not spectacular. Add in 7 cutting teeth per inch and there’s no problem with cutting power. This particular folding knife is unusually efficient as a cutting tool, as well. Approved for cutting dry wood, green wood, plastic, and even animal carcass parts like skin & bone. These are outstanding little saws that will be useful for many people. Whether you’re into bushcraft, camping, or being prepared, it’s a great choice. Even beyond the reasons already given, there are other factors that make this blade an excellent option. This blade is coated to protect from rust and tends to be low friction. 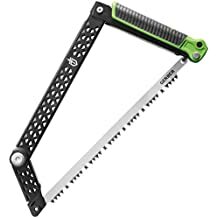 A comfortable plastic handle ensures a good grip and overall is our top pick if you’re looking for a folding pocket saw. Corona is another huge name when it comes to truly high quality pruning saws. This is a heavy duty pruning saw with an ergonomic handle for comfort. The heavy duty blade can do serious work and was originally designed for orange groves. Even the greenest of wood and thickest of thorn vines are no match for this saw. The RazorTOOTH is a truly elite saw. In fact, many see it as the flagship for Corona folding saws. The unique design includes 3-sided saw teeth versus the conventional 2-sided saw teeth. While there can be a bit of a personal preference play here, we strongly recommend the 10 inch model for survival. That extra bit of saw can make a big difference, especially in less than optimal cutting conditions. Easy to carry, easy to safely latch, and easy to use, there’s a lot to love about this saw. 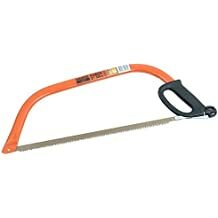 This is a high quality saw both for survival as well as around the house work. You won’t be sorry if you go with this model! Rounding out our top three options of folding hand saws is the EverSaw. This all-purpose portable hand saw is an outstanding option. Featuring a blade that is 8 inches long, the EverSaw 8.0 is made for heavy duty use, features a comfortable handle for easy grip, and a lifetime warranty to boot. 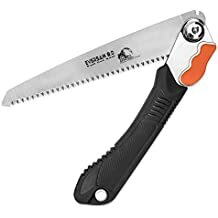 This folding saw is strong and easy to use. The teeth are “triple cut & hardened.” To layman like us that basically means that the saw is made to stay sharper, longer. That’s a pretty good deal, right? 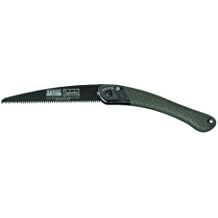 This folding saw proves its cutting ability on a wide array of materials including green wood, plastic, and even bone. Great for use as an at-home tool, and equally effective as a survival saw to take out into the wild. The blade stays sharp, reduces friction, and gets the job done. This blade proves its worth again and again. Easy to pack into a bug out bag or easy to carry, this saw meets the check marks on a survival list. This saw is an outstanding option that adds another quality tool to any collection. If these are the specific types of saws you are most interested then be sure to check out our post on the best folding saws for more great information and a large number of specific saw reviews. There’s no question that the bow saw is an incredible design. We learned how to use saws in Scouting with this particular style. For good reason, too. Bow saws cut extremely effectively and allow you to go through a large quantity of wood with minimal exertion. These are fantastic for Scout Troops, wood working, breaking down wood around a property, bushcraft, or even survival. In other words, a bow saw is a damned fine design no matter how you cut it. Sorry about the pun. That was unintentional. If you’re looking at any list of top saws you shouldn’t be surprised when the Bahco name comes up. They made the best folding saw on our list. Now they’ve made the best bow saw. There are multiple models that could be in this spot since Bahco makes so many models. Generally speaking, you’re not going to be disappointed with any Bahco bow saw. That means outstanding quality in any given survival situation. This model has a comfortable ergonomic handle that includes a finger guard. The saw itself comes in three different sizes of note. The smallest model is 21 inches, the middle 24 inches, and the largest is 30 inches in size. Green wood or dry wood – either way this saw cuts easily and thoroughly. This saw prunes branches with the best of them or works great as a more advanced bushcraft tool. Made from top notch steel frames that are lightweight, as well, there’s a lot to love about the design. These saws pack easily. This is an added bonus for a survival situation. Add in major design points like: the solid pointed nose, triangular saw teeth, and a special hardening process combine for top of the line quality. These popular saws are rust proof and feature sharp heavy duty cutting teeth. A great addition to any garage. Agawa Canyon’s BOREAL21 folding bow saw isn’t like your traditional bow saw. That’s a good thing in this case. Featuring innovative design and construction, there’s a lot to love about Agawa Canyon. This is a bow saw that is designed specifically for survival use. Easy to pack down or pack in, this saw gives all the benefit of a more conventional bow saw. Yet it also packs down more easily for a bug out bag or bushcraft work area. Outdoor fanatics appreciate what this saw has to offer and there’s no denying that Agawa has lived up to their reputation for creating quality tools. The design isn’t just about the ability to break it down. Speed, reliability, and ease of use are all major factors engineered into the final design setup. This is a sturdy and powerful saw. It is also surprisingly stable considering it can go from opened to closed and folded in seconds. The opposite is also true. The saw can be folded out, snapped into position, and ready to saw in mere seconds as well. Designed to be lightweight, versatile, yet powerful, there’s a lot to really love about this bow saw. This saw proves itself as another outstanding option. This is one of the rare bow saws that is built with survival, camping, or bushcraft in mind. The Gerber Freescape Camp Saw keeps that focus even before pruning and around the house/property uses. A simple look at the design shows an innovative construction that sets this model apart. This is a bow saw designed to be easy to pack up, easy to set up, and provides full sturdy support as the cutting is being done. There aren’t a lot of bow saws good for bug out backs or packed up survival kits. However, the innovative design and solid build of the Gerber Freescape means this saw is going to meet those needs. Because of that design there’s no need to screw or unscrew any fastening nuts and bolts. There are no small pieces that get lost, thus making the entire saw incapable of cutting properly at that point. The grip is made from rubber mold to keep your hands or fingers from getting tired over time. This is great to allow you to cut more wood for longer periods of time. This saw features a standard 12-inch blade, making damaged blades easy and inexpensive to replace when needed. Sweden is a European nation that has earned their reputation as a top notch manufacturer. Sven follows this tradition to a T with an innovative and incredibly well made adjustable camp saw. The adjustable bow saw for camping from Sven is great for backpackers, bushcraft specialists, or preppers. Unique, well-designed, and featuring top notch Swedish manufacturing quality, there’s a lot to love about this camp saw and not a lot to hate. The blade features top of the line tempered Swedish steel. The blade is set in a high quality aluminum frame while the back handle is drilled to allow for an adjustable saw angle. A very unique take on the bow saw and one that has found many friends on both sides of “The Pond.” This is definitely a solid option that any survivalist, prepper, or bushcraft specialist should consider. This is the type of saw that won’t let you down! Whether you’re looking for a great tool for all your bushcraft needs or something larger than a folding saw for survival situations, there are plenty of good options. If you’re not totally sold on what you see here then make sure to visit our review on the best bow saws for camping and survival. The pocket chainsaw (sometimes referred to as a manual chainsaw or a survival chainsaw) is the one that most clearly looks like a quote “survival saw.” These aren’t built to be a main tool out of the tool box, but they are a clear upgrade from wire survival saws. Wire saws had been a piece of survival gear for year, though it’s clear that they were often a frustrating tool due to the effort it took for minimal results. The pocket chainsaw actually brings some serious cutting ability to the table while remaining incredibly small, lightweight, and perfect for preppers, survivalists, or anyone who wants to be prepared for any wilderness or long-term emergency situation. This article definitely focuses on the best options that are currently available. The Sportsman Pocket Chainsaw is one of the best survival saws on the market, and a definite favorite of ours. Not only is this is the single most top-rated pocket chainsaw you can find anywhere online. This is a very good option that brings a lot to the table and helps to get the job done. 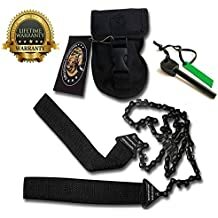 This is a long pocket chainsaw, and has a full 36 inch blade which is a foot longer than the standard 24 inch blades that most survival saws feature. This means more leverage, more reach, and more versatility. Add in some strong and comfortable handles and this is a pocket chainsaw that is completely set to go. This bi-directional pocket chainsaw cuts both directions while self cleaning saw dust build up. This leads to better cutting, smoother cutting, and if you find yourself in the wilderness and in an array of survival situations, you want a saw that has the ability to handle as many situations as possible. This gives you more options and options are a good thing in survival. The individual saw teeth are made from treated steel that helps encourage sharpness and hardness that helps cut through even the hardest woods. The bright orange handles definitely catch the eye and draw in attention. However, there’s a lot more to the LivWild camping chainsaw than just bright colors! The LivWild pocket chainsaw is absolutely loaded with teeth, bragging that they have 3X the teeth of most similar saws by comparison. The large handles mean solid leverage, and the sheer number of teeth means there are no cutting issues that arise. Made from high quality steel, the saw blade itself is 26 inches long. That gives just a touch extra cutting force and in survival situations every bit of cutting ability counts! The carrying pouch is a solid addition, making it easy to carry around this 5-star quality saw. While many people will never find themselves in a situation where they need an emergency saw, better to have and not need than to need and not have. This is a great model that will come through in a pinch. A 100% money back guarantee is offered by the company, as well. 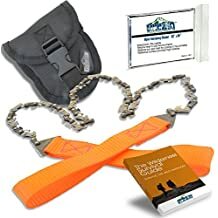 This is not only a great pocket chainsaw but the SUMPRI saw comes as part of a small survival kit that includes a great carrying case as well as a rock solid magnesium fire starter. This isn’t just good bang for the buck but it is a combination that actually makes a lot of sense. If you have a saw for cutting wood in an emergency situation, the ability to start a fire without matches is a massive plus. While obviously we like the kit combination, that doesn’t change the fact that the pocket chainsaw itself is rock solid. This isn’t a cheap or poorly made model. 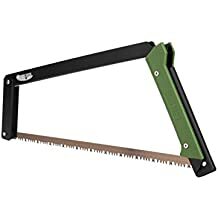 This is a very solid survival saw that is strong, easy to carry, and makes a smooth powerful cut on both green or dry wood. This pocket chainsaw features a 3-foot long (36 inch) blade, once again making it an outstanding options that gives the extra size and flexibility I want in a survival saw. That extra length gives more leverage with the bi-directional blades. The saw teeth consist of heat-treated steel that help them stay sharp and cut right through whatever you need. This saw has a 30-day full guarantee and there’s no denying it is one of the best options that we have found. This is the type of pocket chainsaw that just screams “Survival situation,” and while I like the idea behind it, there are some reservations. This doesn’t involved the saw blade itself which is great. Easy to fold, lightweight, and a solid 24 inches of cutting power. This isn’t the longest pocket chainsaw option you’ll find out there but it is built well. The paracord handles are a great idea in theory. Paracord is a pretty amazing potential piece of survival gear and we have done plenty of articles on the various ways that truly good parachute cord can make a difference. There’s a reason that paracord bracelets have caught on so much with the survival/prepper community. However, there is one problem with this idea: how do you use the saw once you remove one of the handles? 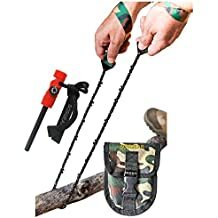 Having paracord on hand is great but if you have to destroy the survival saw to use it then suddenly everything as a whole seems just a touch less useful. Maybe we’re missing something here, but this seems clearly the case where the idea is better than the item. That being said, this is still a great survival pocket chainsaw option. If you would like to know more check out our blog post on the best pocket chainsaws. There are many different styles of survival saw out there. The fact that there are three separate types can make it even harder to create a general “what to look for” list. That being said, good survival saws have a few things in common. Whether you’re looking at a bow saw, folding saw, or pocket chainsaw there are some common factors that come up. The saws need to be easy to use, easy to pack, and easy to carry. When they’re focusing specifically on saws that will help with survival, easy to carry is especially important. These saws need to be practical for a variety of situations. Transportation by vehicle? Check. Part of a bug out bag? Check. Ability to be carried while walking through the woods? That definitely needs to be a check. The designs need to be practical for use in all the situations where you can imagine needing a handy saw. The designs need to be practical for storage, carry, and finally use. While a giant bow saw is a great tool, the largest sized is not going to be practical when it comes to survival situations. Versatility can mean a lot of things, but a folding saw should still work in a snap as a pruning saw, a survival bow saw should work just as well in a workshop as the woods, and even the pocket chainsaw needs to be able to reliably cut from multiple angles and multiple pieces of wood. There are many different designs of saws out there but not all hold up to tough scrutiny. Since survival can happen at any time and usually in less than ideal situations, you need a saw versatile enough to have with you in all those potential situations. Durability matters. There’s no such thing as a good survival saw that isn’t durable. Anything made for one or two uses is not a tool you should be buying for any reason. Each of these saws may have very different designs, even within styles, but all of them are going to be well-designed and well constructed. Look for durable survival saws. Q: Which type of survival saw is the best option? A: This really is going to be a preference thing. If you prefer the pocket chainsaw then that’s the best option. If you prefer a more conventional model of saw then that will be the best option. Basically you want to buy a saw you’re comfortable with & familiar with. Q: What advantages do a pocket chainsaw have? A: Pocket chainsaws embrace that tag of “survival” extremely well. They cut much better than wire saws, are lightweight, and pack easily. Taking up minimal space but able to break out for serious results, pocket chainsaws are an outstanding true survival option. Q: What advantages does a folding bow saw have? A: The folding bow saw features long term usability as well as a tool that helps break down a lot of wood fast and allows a lot of control over precision cutting. In other words, if you find yourself wanting a heavy use saw then this is the option. Q: What advantages do a folding hand saw have? A: Folding hand saws feature a versatility that makes them popular. These saws prune out of control hedges. They are also good for taking care of left over damage after a storm when you need just a bit of cutting. Q: What is a wire survival saw, and why don’t any appear on this list? A: The wire saw is an old survival saw model. They don’t hold a candle to pocket chainsaws. Pocket chainsaws evolved naturally as the next step up. Q: Isn’t a survival saw on a Swiss Army Knife enough? A: Absolutely not! These are more decorative than anything else and certainly don’t hold up to a true survival tool. Q: How does a survival saw compare to an axe? A: Both are outstanding tools in a survival situation. Survival saws might not be consistently handy as an axe or built to last that long but they are easier to carry in everyday situations. Packing these saws is also easier because of their smaller size and various makes. Q: Is there any reason to have more than one type of saw for survival situations? A: Sure. You never know what area you’ll be in or if you’re in a long-term camp. Each saw features its own sets of strengths and weaknesses. Not everyone will need one of each type, and many are fine with just one saw. However, there are situations where having all three could prove to be advantageous. There are many options when it comes to finding an outstanding saw for any and all potential survival situations, and it’s important to choose right. A great knife, a sharpened hatchet (when available), and the right survival saw are incredibly important tools and together can make all the difference between life and death.